I’ve said it before, and I’m not afraid to say it again, Kim’s Family Restaurant is my favorite place for Korean food in Singapore. I like it because they always serve ten side-dishes (I like to call them appetizers) no matter how many main dishes you ordered, I like the tasty and affordable Korean food there, and I like the fact that they are just ten minutes away from my place and I can have Korean food whenever cravings call. I like it, because I like it. Why am I even explaining? Make a trip there and you will know. 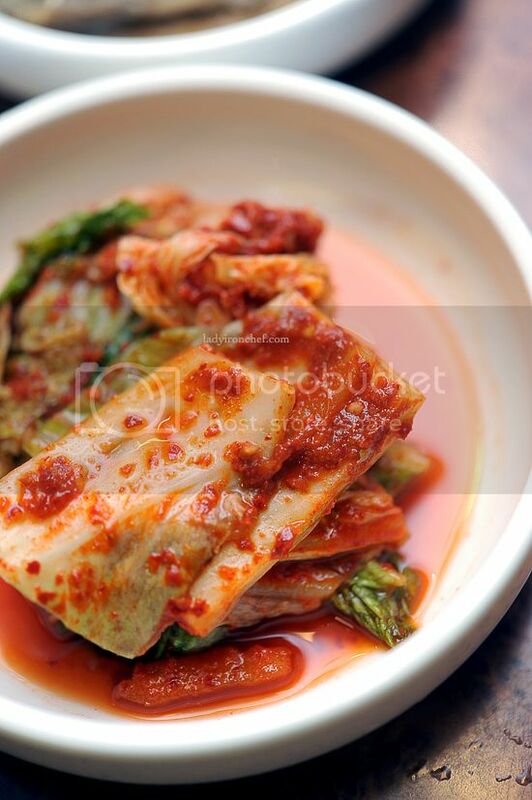 As for kimchi, I’m sorry to admit, she’s just not my type. Even after trying it for a few times, kimchi just doesn’t do it for me. Sure, it’s a great appetizer, sour, slightly spicy – the perfect combination to get your palate going, but I’m just not that into kimchi. I know there’s at least a dozen of people will hate me if I say this, but I have never been a fan of Ramen. Fine, maybe it’s just me, but ordering ramen makes me feel like we are paying restaurant price for instant noodles. With the increasing number of Japanese Ramen restaurants opening in Singapore, all the ramen-lovers are rushing to compare which place has the best ramen, but you know what, I don’t crave for ramen, so unless someone drag me along, it’s highly impossible for me to explore any ramen restaurants. Okay this is tricky, since we did ordered Ramyeon ($8) with meat. It wasn’t too bad, I like the intense flavor of the stock, and the presence of egg, meat, seaweed that made the ramen, uh, tasty. Bibimbap ($10) is, of course, delicious with chili, lots and lots of red spicy-sweet chili. Topped with ingredients like meat, seaweed, beansprout, and vegetables, and mix together with chili; the hot stone pot kept the temperature of the rice pipping hot – it’s perfect! The Seafood pancake ($10) is a lovely appetizer, but do not let the word appetizer mislead you; the portion of the Korean-style pancake was more than enough to feed the four of us. If you have another place that serves affordable Korean food with lots of side dishes, please let me know. For now, I will stick to Kim’s Family Restaurant. Oh my goodness! This is fantastic! I’m Korean and I LOVE Korean food! Go figure! Everything looks amazing!! What great photos! I’ve been there and i had udders after. Hehe I thought I was the only one who didn’t get what all the fuss about ramen was! But aren’t Korean Ramen and Japanese ramen totally different? Bibimbap is my fav korean dish, so easy to make but still so delicious. I love the Korean spicy soup! u really busy huh? lol 4 months later then post this. Korean ramen isn’t quite my style but you really should try Japanese ramen. For Korean ginseng chicken, there’s an outlet at Suntec Sky Garden (or something like that) — I find it very tasty. Angeline: When? Me want to try too, but it don’t look cheap. misterang: No la, it’s only two month plus, we went there in Nov i think. no choice, too many posts! Emy: I know, tried both korean and Jap ramen, but I don’t really fancy both of them. I have yet to try Korean Ginseng chicken, must try it next time! The bibimbap looks fantastic. And a must-try. But Im not a big fan of kimchi either! Ugh. Me no likey! I have always loved that place. It is unbeatable with any other Korean restaurant I have found in Singapore. I didn’t like the Kimchi, too salty, and it would be better if its more spicy. Had the bibimbap, still prefer the one at my school hall canteen though. I share the same sentiments for Ramen. haha.. ya, instant noodles, which i don’t like. 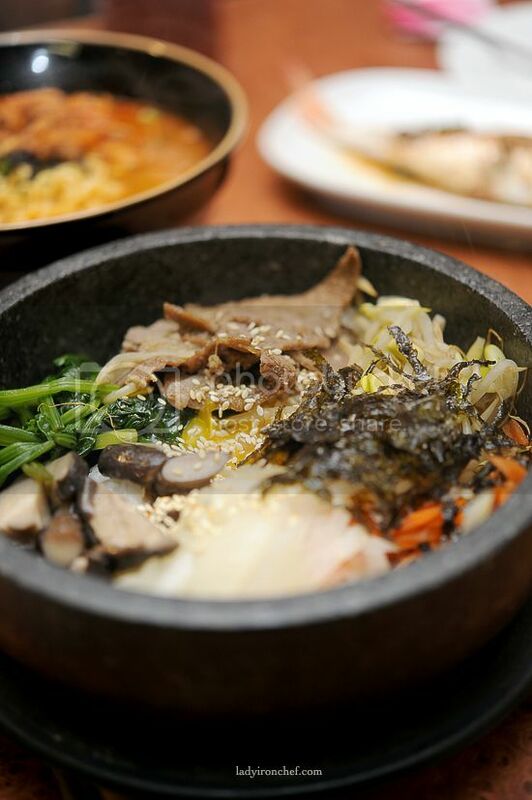 Pa jeon, bibimbap & korean style hot-pot are my fav Korean food.. Will visit this place during the next trip to SG! Shayna: School canteen bibimbap is better? whoa. nope i din tried the one at East coast, you can’t remember what is it called? Sweesan: oh yes, please do. But since u are coming to Singapore, need to try all Char Kuay teow, laksa, chicken rice first ok? Shirin: hahaha i have been gaining weight too! trying to exercise and run more! yeah bibimbap is good stuff, do you have nice Korean food over yr side too? I always go to Togi at Mosque St for korean, not too bad and I like the homely feel. Crystal Jade’s korean is surprisingly good and very authentic. KIMCH (and the ‘ten appetizers’ you wrote) is NOT an “appetizer”. They are all side-dishes. 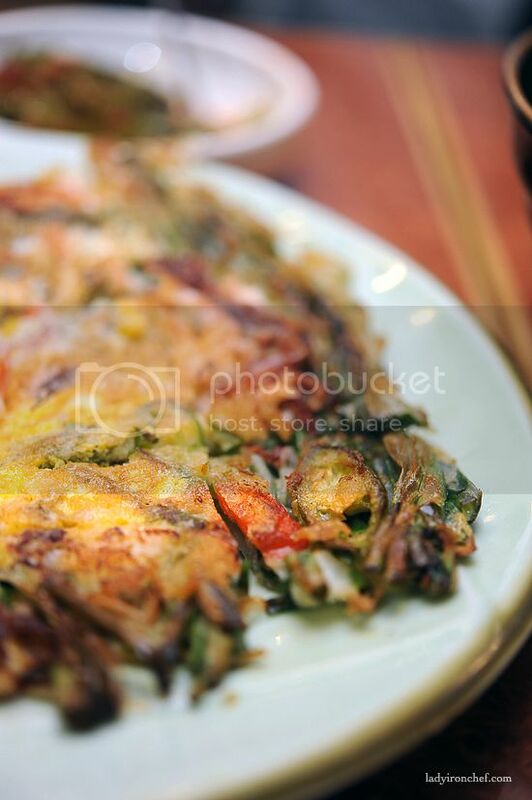 You should EaT THEM AS YOU EAT MAIN DISHES (or a rice and a soup, more like a Korean homestyle). For example, try to eat kmich and other ten mini dishes with remyeon, bibimbap, pancake, ect..
That’s the best way to enjoy Korean food. 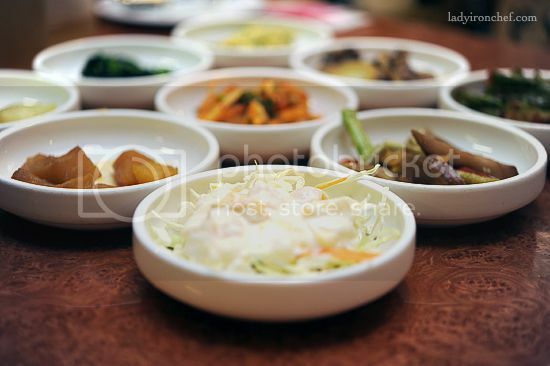 Kimch and other mini side dishes give you a lot more favoure along with main dishes. And for the Ramyeon, It’s NOT SAME with Japanese Ramen. 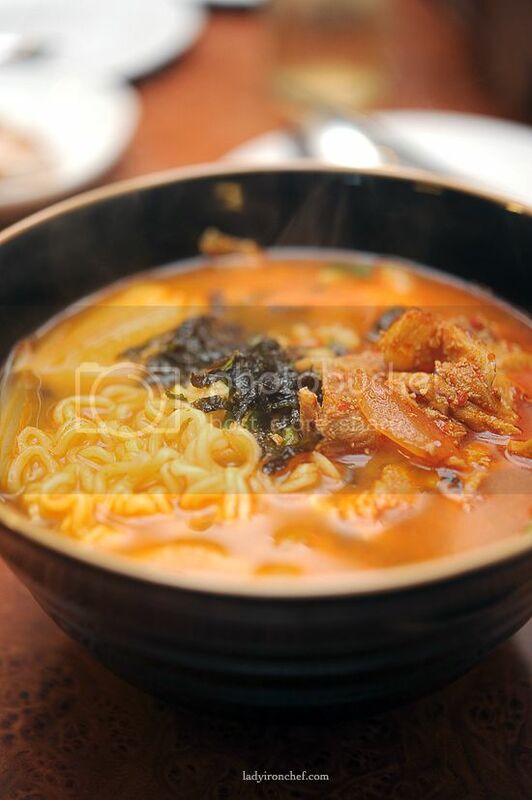 Korean ramyeon is an INSTANT NOODLE which you can buy at a store, and a cook cooks it for you, that’s all, no exception. In the other hand, Japanese ramen is usually cooked as an ordinary noodle dise. You expect nice broth made by a cook. Hello Jane: Thanks for the correction, i also tend to remember them as appetizer rather than side-dishes (even though i always know it’s side dishes through watching Kdrama). I’ll take that Bibimbap anyday though. hey there! i know this is totally not related, but i like to ask if you know where can i get 3D design durian cake? i’ve seen it once last year, but i clearly forgot where it’s from. any idea? thanks! try Your-Woul at Goldhill Plaza. They do the many dish starter too. amanda: Hello there, i’m not too sure abt 3d durian cakes, but Goodwood park Hotels are famous for their durian desserts, maybe you can give it a try. Japanese ramen you can try Marutama at Central Mall. Personally I like it better than the Gallery Hotel version. I’ve been told there’s another place in East Coast (opposite Obolo)that has very good ginseng chicken but I have yet to try it. emy: i tried marutama before, but the biggest fan of ramen though. there’s so many ramen places in Singapore. how many have you tried so far? You should try Ramen Santouku at Central and Ramen is Art (I THINK that’s the name) at Robertson Quay. The pork cheek ramen from Santouku is heavenly! Both have really great thick creamy broth. You really should try more Japanese ramen! Ju Shin Jung, located at East Coast and YESS Centre, serves great korean food as well. Like Kims’ they serve about 10 different types of side dishes at the start of the meal and the best part – it’s free flow! And free of charge! Even when you keep asking for more! Hello Elinn: Thanks for the recommendation. I have tried ramen santouku before but i din blog on it yet. Which part of roberton quay is “ramen is art” located at? haven see it around before. Ju Shin Jung is kind of pricey for 2 persons. If you can go there by a group of people of 4 or 5, it is worth it. You can try two types there, BBQ and Steamboat. For me, I prefers BBQ. :) If you try BBQ with Korean Wine, it is perfect match. I recommend to try at YES center. If you wanna go on Friday, Saturday and Sunday, you should make a reservation first. Would like to add my 2 cents worth. I love korean food and i typically enjoy the one at Amara and Itogi at chinatwon. 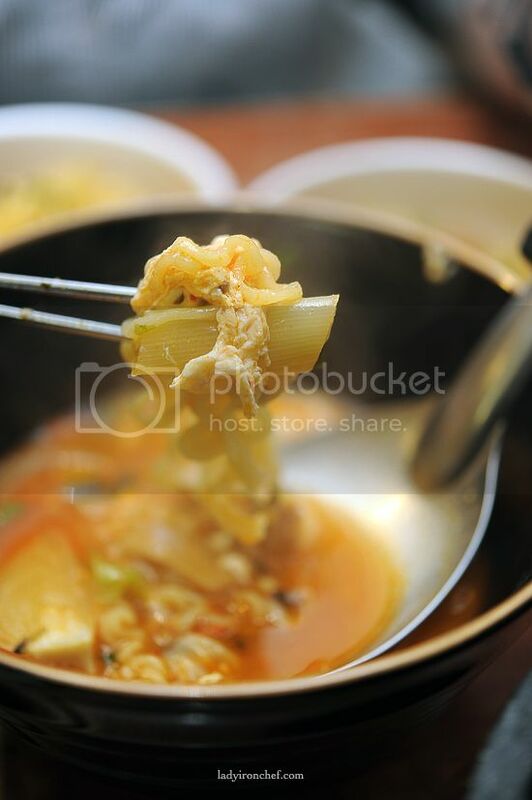 Fantastic seafood soup they serve and the side dishes can be ordered again at no addtl costs. Prices have gone up abit but i will still patronize these 2places which are my favourite. Any one can advise where else will i get good korean food with decent pricing ? I was TERRIFIED at Kim’s family Sunset way branch last evening, we found a baby cockroach in the Ginseng Chicken soup! If we were dining in a hawker centre, I would have taken it slighty easier. We informed the manager in charge and of course they apologised for the negligence. Is this the same restaurant chain that is in Sunset Way? We had terrible food. Service was not that goo either. The six dishes we started out lacked flavor. I could make better at home, which defeats the whole purpose of going out. Too bad as they just opened up on West Coast Road near where we live but we will never go back to Kim’s. Rather go hungry. I love to eat Korean food, but it’s kinda difficult to find it in Singapore, other than Seoul Garden (not-so-Korean), I cannot find any, recommendation guys? Hi, as a Korean I must let you know that kimchee is not considered an appetizer. It is almost always eaten with rice or noodles. I don’t think the one at Sunset Way is run by Kim’s. At least I hope not. The restaurant name at said address has changed. The food is dismal. Chinese Korean fusion?